Now, with this floating notification app, you don’t need a rooted Android device nor install ParanoidAndroid ROM. This isn’t exactly identical to ParanoidAndroid ROM’s HALO feature (as it doesn’t overlay app) but it still is very useful I think. With the floating notification app, you will be able to easily see your notification pop up in little circles while you are browsing the web, playing games, etc…etc… The beauty of this app is that you will be able to easily see your notifications and get to them without doing redundant swipes over your status bar. *Note – This app is still in its “alpha” stages, there may be bugs but should get better as we go along. Once you use floating notification app, you will never go back. 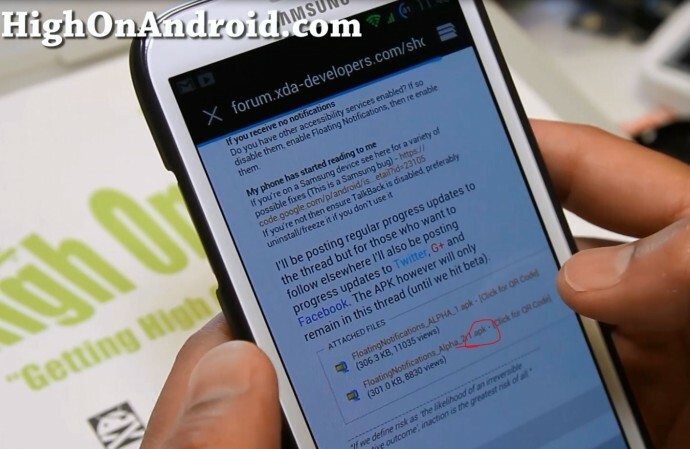 Here’s how to install floating notification app on any Android device, no root required. Step 1. Download and install the Floating Notifications APK file, this will install the app. Step 2. Once downloaded, click on it to install. If you get “Install blocked” errors, hit “Settings”. Then make sure “Unknown sources” is checked ON. Use a file manager app like ES File Exporer to re-open the APK file you downloaded and install it. Step 3. Go into Settings->Accessibility on your phone and make sure “Floating Notifications” is checked ON. Step 4. 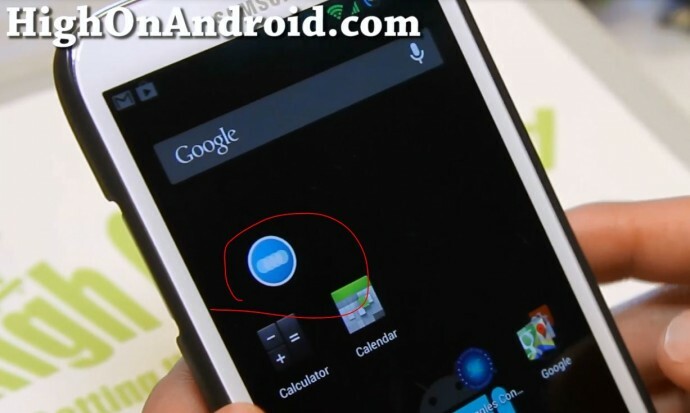 You should now see a floating notification circle somewhere on your Android device. Step 6. Once that’s done, you should start receiving floating notifications from the apps you’ve selected. Enjoy and don’t forget to get your friends high on Android with this app! You are awesome !!! Thank you. Just a quick question. How heavy is it on RAM usage? Works on htc Incredible S. Thanks a lot. Thx for this lovely app ! once the app is installed and configured, is there a way to take off the system’s notifications from the tray, I mean the ones that were there before ? In fact installing this app, adds just another layer of notifications, there’s the bubbles and the tray’s notifications. Moreover, the link between the bubble and the corresponding app, is only unidirectional. I mean by this that if you check directly the app, the bubble will disappear but the other way around doesn’t work. For example with an email, you open the message directly from the app and the bubble will disappear, but if you check the bubble directly, the email isn’t marked as read. I hope my question are clear enough ! Thx anyway for you hard work ! Please help. This is driving me insane. I installed the app from the play store because I cant find the apk file and I enabled it and everything an now when I am in my app drawer if u scroll a pafe it annoyingly says page whatever of whatever page there is. My talkback is DISABELED!! What is going on? Help cant find the link to down load the apk for floating notification. Im on ada forum page I was lead to, I must be blind. can some one help please and thank you. 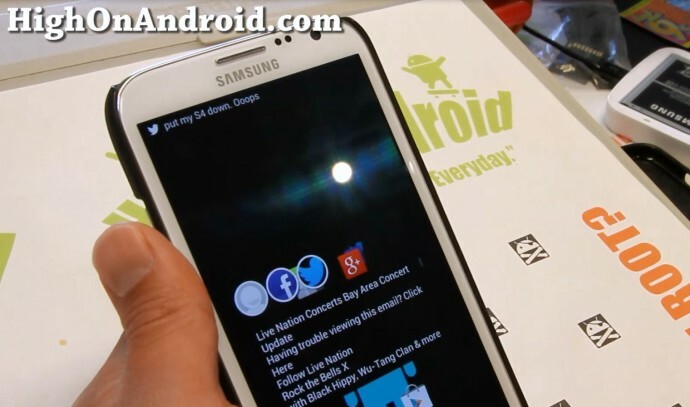 Previous story Galaxy S4 Giveaway!